Fire in the workplace has the potential to cause devastating effects to organisations and industry. Consider not only the potential loss of life, but also life changing injury, damage to property and damage to the environment. In addition a fire in your organisation could cause substantial loss of business. 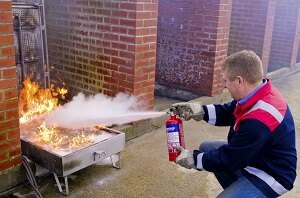 This might be through the resultant lack of trust/loss of reputation if an inquiry finds that your workplace had inadequate fire safety training, policies and procedures in place or, as will almost always be the case, because of damage to your premises which makes trading difficult or impossible. A staggering number of businesses fail within a year of having a significant business interruption of this kind. So, considering the potential damage to your business, the potential increased overheads due to relocation, re-equipping, raised insurance premiums, staff training and possible court costs and compensation why wouldn't you undertake fire safety training in your organisation today? At First Safety Training we can help with all of your fire safety training needs, offering half day training courses in Fire Safety Awareness and the role and responsibilities of the Fire Marshal/Fire Warden together with a more comprehensive Level 2 course in Fire Safety. Our experienced tutor ensures that all fire safety training courses include both theoretical and practical training sessions as well as periods to ensure candidates not only understand the theory behind the "why and how" but get to see examples and best practice in play. Table top exercises and practice periods are used to confirm their understanding. Courses can be tailored to meet your organisation's needs.